When most edibles are made, they’re infused with a distilled oil because it checks most of the boxes: it doesn’t taste too much like pot, it’s potent, and it’s easy to infuse with foods. But the box it doesn’t check deals with how long it takes for the high to kick in—it can take up to two hours, so an edible high is something for which you need to plan. The reason? Distillates are oils, and oils are lipid-soluble, meaning the THC needs to bind with fats which are then processed in your liver, and that takes time. And that “time” time has always bothered me, just as it bothered Justin Singer, who is one of the founders of “Ripple,” an infused edibles manufacturer that supplies The Greenery with products. But Singer did something about it when it bothered him (instead of complaining like I do) and he invented a water-soluble form of THC distillate. With this new form of concentrate, the THC doesn’t need to bind with fats and be processed in the liver: it gets into your system via absorption as soon as you eat it, and it does so in three different places: sublingually (under your tongue), intestinally, and hepatically (in your liver). 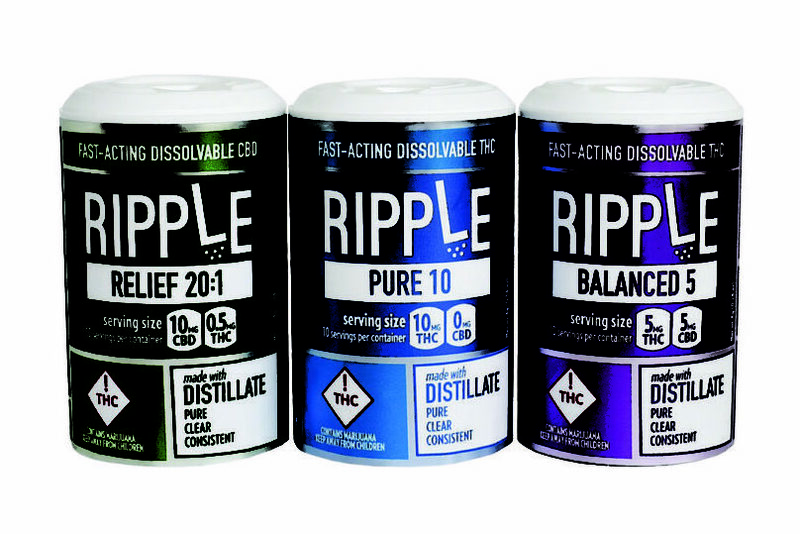 It’s all thanks to osmosis, which is a property of water-soluble compounds that allows them to permeate the semipermeable membranes in your body—the science is fun, but all you really need to know is that edibles made with Ripple can take effect after twenty or thirty minutes, which is awesome. 1.) Ripple Pure 10. This product sells for $29 out-the-door, and each bottle contains 10 packets (10mg THC each, for a total of 100mg THC per bottle) of tasteless, odorless, instantly-dissolvable powder that can be added to any drink or food to turn it into a cannabis-infused edible. You can put it in water or juice (or spaghetti sauce, for that matter), so the versatility of this product is unparalleled. 2.) Ripple Balanced 5. The pricing and usage of this product is similar to the Pure 10, but each packet in this product contains a powder that delivers 5mg THC and 5mg CBD for consumers who are looking for the high of THC and the medicinal properties of CBD all in one place. 3.) Ripple relief 20:1. Again, the price and usage are the same for this product as with the last two, but each of these packets delivers 10mg CBD and 0.5mg THC for consumers who are looking for the benefits of CBD without the high of THC. Seriously, Singer covered all the bases when he rolled out Ripple. 1.) Stillwater Blood Orange Gummies. This product sells for $24 out-the-door, and it contains 20, 5mg THC gummies for a total of 100mg THC per container. Thanks to these delicious gummies, we have a bona fide fast-acting edible on our shelves. And this product is doubly awesome because with most gummies, you get 10mg servings instead of 5mg servings, so you can control your serving size much more accurately with this product. 2.) Stillwater Green Tea Mango Gummies. This product is $24 after tax as well, and you still get 20 gummies per container, but each serving delivers 2.5mg THC and 2.5mg CBD for the balance quite a few people ask for when they come into our dispensary. 3.) Stillwater Honey Lavender Gummies. This product is also $24 OTD and it contains 20 servings as well, but each gummy delivers 5mg CBD and 0.25mg THC for the high-free CBD experience for which medicinal shoppers are looking.